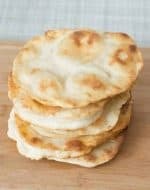 This easy baking powder healthy fry bread recipe really is easy because it’s made with baking powder instead of yeast so you don’t have to wait for it to rise. That saves a lot of time. If you want to know how to make Navajo Tacos which uses this recipe to make the fry bread for the tacos, it is right here – Healthy Navajo Tacos Recipe. I think that one of my favorite parts of summer is being outside at the local fairs and farmers markets. They often have Navajo tacos and they are so good. I used to think they were sooo much work until I developed this recipe. One of the ways this recipe simplifies things is that you really don’t need all the tons of oil they use at the fairs. I put just enough oil to coat the bottom of the pan, but you are welcome to put more if you want. The other thing about this recipe that is a lot simpler than the traditional Navajo taco recipe is that the dough doesn’t use yeast, so it doesn’t have to rise, which is much easier and cuts way down on the prep time. My kids LOVE to roll out their own dough and then I put it in the oil and take it out and then my kids start fighting over who gets the first fry bread. They eat them almost as fast as I can make them, which is saying a lot because they don’t take very long to fry up. As for flours, I’ve tried it with regular white flour, spelt flour and einkorn flour. They all work well, but all these flours need different amounts of liquid. Regular white flour usually needs 1 cup of milk, depending on the altitude and the brand of flour, etc. Spelt flour usually needs a little less liquid and einkorn flour needs a lot less liquid, like maybe a full 1/4 cup less. I’m not sure because I don’t measure. I just keep adding milk until the dough comes together at a good consistency. You know it’s ready when you can knead it easily and it doesn’t stick to your hands. I haven’t used whole wheat flour myself on this Healthy Fry Bread Recipe. I usually use einkorn flour. It’s so light, easy to work with and delicious. But if you want to do whole wheat flour, you will probably need more liquid. Also, let the dough rest for 10 minutes instead of 5 minutes to give it time for the flour to soak up the liquid so the tacos aren’t dry and gritty. Alternately, you could put your dry ingredients in a food processor and let it run on the dough setting and slowly add milk until it pulls together and comes away from the side into a ball. It’s actually pretty cool and fun that way. Hope you have fun making my Healthy Fry Bread Recipe. This Clean Eating navajo taco fry bread recipe is super easy because it doesn’t have to rise and pulls together in a few minutes. You can even get away with only putting a little oil in the bottom of a pan. My kids totally love this stuff! In a medium bowl, stir together the flour, baking powder, and salt. Stir in milk, and mix until the dough comes together. The amount of milk is an approximation. Just add a little at a time until it comes together. With the einkorn, you will need a lot less milk, like maybe 1/4 cup less. Add more flour if necessary to be able to handle the dough. On a floured surface, knead the dough until smooth, at least 5 minutes. Let the dough rest for 5 minutes. Heat oil in a large, deep heavy skillet to 365 degrees F (180 degrees C). Oil should be anywhere from just coating the bottom of the pan to 1 1/2 inches deep. Break off 3/4 cup sized pieces of dough, and shape into round discs 1/4 inch in thickness, making a thinner depressed area in the center. Fry breads in the hot oil until golden on both sides, turning only once. Drain on paper towels. 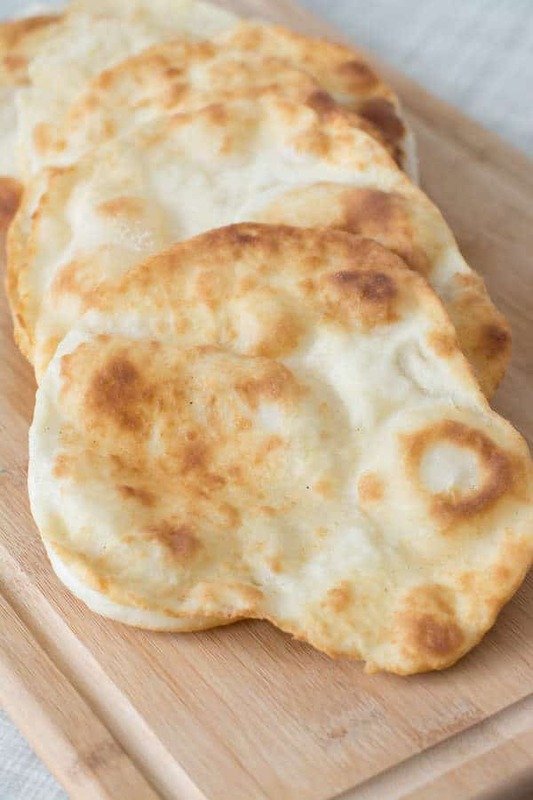 I love this baking powder Healthy Fry Bread Recipe, do you? Previous Post: « 9 of the Best Ever Clean Eating Grill Recipes – Get that Grill Warmed Up! I can’t use dairy, can I sub a nut milk for the cow’s milk? Yes. It should work fine. I haven’t tried it myself, but will please come back and comment and let me know if it works, so other people will know? This sounds way faster than fry bread with yeast in it. So the dough is almost like making biscuits without the shortening, and flattened then fried? Pretty much. I’ve actually heard of people use canned biscuits and frying them to make fry bread. Never thought of it as biscuits, but I guess it pretty much is.